“[speaking to U.S. Army M.P.s he knew were Germans in disguise at the fuel supply camp, in a sarcastic voice] Does the road to Amblève still lead to Malmedy? My Take on it – Henry Fonda and Robert Shaw both play opposing Colonels who try to outsmart each other during the final days of WWII in 1944 Belgium. The similarities between the military hierarchies of the allies and the Germans is interesting and you see two men who want to beat the enemy by using different wise tactics. 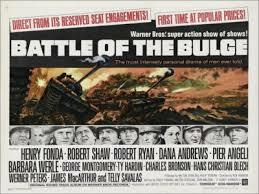 Besides the psychological war being fought by the two men, the rest of the movie comprised of many battles using lots of infantry, tanks and even deception to try and conquer the enemy. Great supporting parts by Robert Ryan, Telly Savalas, George Montgomery, Dana Andrews and Charles Bronson (Who seems to show up a lot in these kind of movies during the 1960’s). Great war scenes for a movie from the 1960’s and it was pretty entertaining to watch, but still not a good as The Longest Day (1962).